Windows 7 is definitely one of the best operating systems created by Microsoft. There can be no doubt about it. However, in order to install and run Windows 7 on your PC, your hardware must be powerful enough to handle it in the first place. The operating system, with all its inbuilt functionalities, does require quite a powerhouse PC in order to perform at its best. Here are the basic Windows 7 requirements, without which this top of the line operating system simply cannot work. Well, for starters, make sure your processor runs at least at 1 gigahertz (GHz). Any slower processor than that and you should not even consider installing Windows 7 on your PC. The operating system, just like any other of its kind, is processor-intensive, meaning it will need oodles of processing ability to unleash the power of all those power packed functionalities. If you wish to run the operating system in 64-bit mode, make sure that you have a 64-bit processor. Otherwise, a 32-bit processor will be sufficient. Up next, its time to take the amount of system RAM into account. You need at least 1 GB of RAM in order to even boot up the Windows 7 32-bit version. A powerful operating system like Windows 7 needs enough memory to run its processes well. So, make sure you have menimum 1 GB of memory; the more the merrier. That way, the operating system will not feel starved when running other applications. Oh, and if you are planning to run Windows 7 64-bit version, make sure you have at least 2 GB of RAM on board. Windows 7 installs a lot more files than most previous versions of Windows operating systems (except maybe the server editions). So, you will definitely need to have a high capacity hard disk to satisfy the space requirements. You need at least 16 GB of free hard disk space if you wish to install the 32-bit version of Windows 7 with bare minimum options. Any optional utilities you install will need extra space over those 16 GB. You will also have to keep some space for the Windows page file. So make sure you have a high capacity hard disk with at least 120 GB space. That should get you through the basic, everyday office operations. Thats for the 32-bit version, however. If you wish to run the Windows 7 64-bit version, make sure you can provide at least 20 GB of hard disk space for just the bare minimum installation. The page file will also be significantly larger in size than that in 32-bit mode. You must have a graphics video card that supports DirectX 9 and has a driver of WDDM 1.0 standard or higher. These were just the bare Windows 7 minimum requirements. Other Windows 7 Requirements in order to run some specific types of applications. Internet access: It is an essential requirement if you wish to keep your operating system and essential utilities like antivirus software and drivers updated to their latest versions. You will need additional hardware for this, such as a network card or a modem. Your RAM consumption may also go up slightly, as long as you are connected to the internet. Also, for using the HomeGroup inbuilt network connectivity option, you will need a network card. Make sure you have Windows 7 running on all PCs that you attempt to connect to the HomeGroup network. Windows 7 Requirements for Gaming: In order to play the latest games in the highest graphical settings, you will definitely need more than 2 gigabytes of RAM, along with a proper PCI Express graphics card. The Windows page file may also need to consume additional disk space. Video Playback and TV viewing/recording: These tasks may require lots of additional processing power and RAM, depending on the resolution of the video. Also, be prepared to splurge on a TV tuner card, if you wish to watch TV on your PC, or record the broadcasts. If you record broadcasts, make sure you have lots of free hard disk space. Some of the recordings can be very large in size. Windows 7 Touch Requirements: This function allows you to control applications by tapping, pressing, or clicking your finger on the monitor itself, eliminating the need to use a mouse or other pointing devices. Obviously, you will need to have a touch screen monitor and compatible drivers in order to use this functionality. Music: In order to play music, you will need to have a sound card installed in your PC. If you have one built into your motherboard, you will be able to listen to music just fine, but may need a little extra RAM. DVD/CD Burning: You will need to have an optical drive in order to burn CDs or DVDs. Also, make sure adequate RAM and free space in your hard disk, in order to avoid Buffer Under-run errors on discs that you burn. Windows 7 Requirements for XP Mode: This mode will allow you to run software programs that only run under Windows XP, but you will need at least 1 GB of extra RAM, and 15 GB of extra hard disk space. You will also need a processor that supports hardware virtualization with Intel VT or AMD-V (depending on whether your processor is from Intel or AMD). BitLocker: This inbuilt utility makes your files almost tamper proof against hackers, but will need Trusted Platform Module (TPM) version 1.2 installed in order to work. Also, in order to use BitLocker To Go functionality (which allows encrypted files to be taken to another PC and accessed from there) you will need to have a USB flash drive. Well, thats about it. These are the basic Windows 7 requirements that your PC needs to satisfy in order to run the operating system properly. If you have the required resources, install Windows 7 today. It will certainly be the very best computing experience you will ever have. What do you think about Windows 7 Requirements? 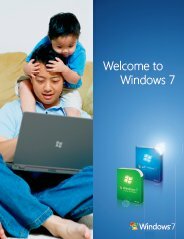 Do you have any Windows 7 Requirements experiences, ideas, article, story, opinions, errors, problems and tips which you would like to share? Why not take a few moments and Share it with everyone!